Recognising excellence in NSW farming combined with innovation, sustainable, safety and profitable enterprises. 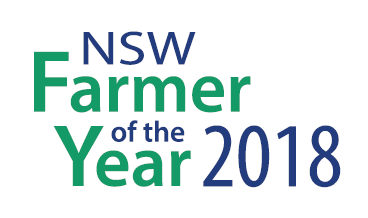 The NSW Farmer of the Year Award is a joint initiative between NSW Department of Primary Industries (DPI) and NSW Farmers with the support of SafeWork NSW and The Land Newspaper, open to all farmers in NSW. The Award is designed to showcase the NSW primary industries sector by recognising excellence in farming, acknowledging farmers who combine Work Health and Safety and environmental sustainable practices with profitable production and encouraging innovation, research and leadership in farming. The successful ‘NSW Farmer of the Year’ will be awarded $10,000 and the other finalists will each receive $2,000. To further develop and improve their farming enterprise all finalists will also be invited to form part of the NSW Farmer professional network. Riverina grain farmers Glen and Julie Andreazza have been announced as the winners of the 2018 NSW Farmer of the Year Award (FOTY). The couple have been recognised for farming excellence on their 370 hectare grain farm at Willbriggie, south of Griffith, where they predominantly grow rice, wheat and recently corn. View the profiles of Glen and Julie Andreazza and finalists Gavin and Karina Moore.